But ResourceSpace can dramatically reduce the time that's spent on getting the files you need, when you need them, and to the right people, as we talk you through just three of the ways that digital asset management can make you more organised and streamline your marketing workflow. 1. Find it as soon as you need it! With our intelligent search options, you'll be able to access your resources with speed and accuracy, axing the time and effort that you spend sifting through endless folders and files to find the item you need. You'll also benefit from instant file previews for hundreds of images, videos and document formats, including page by page browsing of PDFs and automatically generated web-ready video previews. It's as fast as find it, view it, use it. Cut the time that you spend altering the size and format of your files and avoid the middle man of photo editing software. Upload a full size or high resolution photograph or video, and ResourceSpace will generate an array of smaller sizes and a variety of formats. This allows you to select the custom format and quality appropriate for the needs of your project, whether that's print, online, or for use on social media. For example, a large TIFF image may need various sized versions for going to print, using on a website and posting on Twitter, while a high res video can easily be turned into a YouTube friendly file. Original, or reformatted items can be directly downloaded to your computer in a variety of sizes, and video and image assets can also be exported directly to YouTube and Flickr for a more efficient approach to social sharing. Sharing resources with colleagues has never been easier, as by managing your assets digitally, there's no longer any need to spend time and space emailing files back and forth to co-workers, removing the hassle of finding items from the depths of an inbox or conversation thread, and saving computer storage from saving images and documents to the hard drive. Sharing relevant files in a joint collection or via an individual URL allows immediate and controlled access to those who need them, making collaborating quicker and more structured with the use of a central hub for mutual assets. Everything will be easily available and ready to use for internal users, and you'll also be able to respond faster to external resource requests by promptly and securely generating a URL for the collection or file in question. 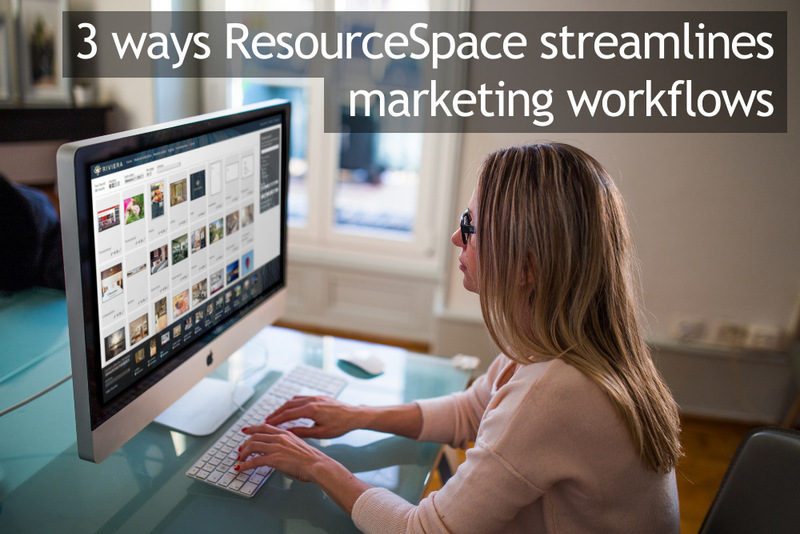 If you're looking to free up time and creativity to help your marketing workflow run effortlessly from the creation of a file to its end usage, start your free trial of ResourceSpace today to see how much easier it is to manage and share your assets digitally.